Only in her first year of study at IHPME, this past August Crystal Milligan was selected as a finalist for the Outstanding Paper Based on a Dissertation distinction at the Academy of Management Annual Meeting in Chicago, Illinois. Her paper applies a complex adaptive system lens to organizational learning theory in order to understand the characteristics of learning in an organization, in this case, health systems. 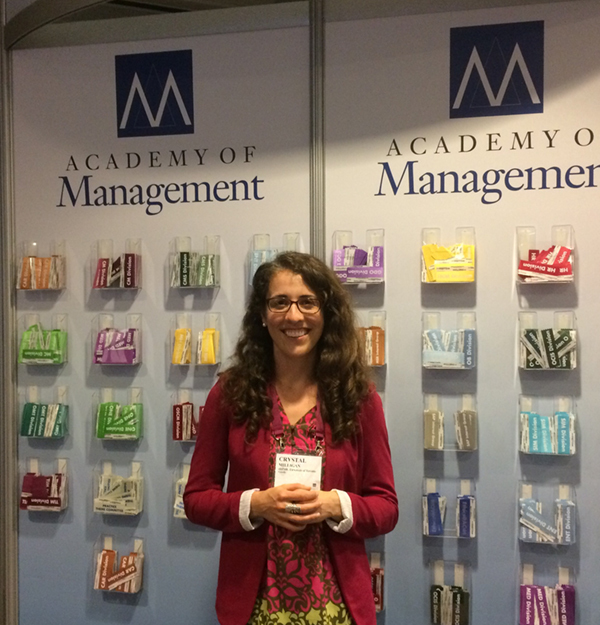 Crystal Milligan at the Academy of Management Annual Meeting. Photo courtesy of Crystal Milligan. “I want to better understand how a learning health system actually learns. I integrated theory to develop what I call the “adaptive learning model,” focusing on the relationships between people, and engagement between the organization and its external environment,” explained Milligan. Originally from Yellowknife, Northwest Territories, Milligan is a manager in the division of Indigenous Health and Community Wellness in the territorial health department, where she has worked on issues relating to cancer, cultural safety, social determinants of health, and community development. Through her work, she has also become familiar with differences between models of health as understood from both the Western biomedical and Indigenous worldviews. “In co-facilitating cancer sharing circles with an elder, the number of times someone would come up to me and say ‘I knew I had stage 4 cancer, but I didn’t want to go to the health centre because it does not resonate with me,’ -made me realize we need to be thinking beyond our current biomedical model of care,” said Milligan. Milligan hopes to build on her theoretical paper by further exploring the engagement between health systems and Indigenous communities, and asks how we can incorporate Indigenous concepts of health to provide better health care for all populations. Milligan is also a recipient of IHPME’s Health Equity and Social Justice Award in honour of Diana Moeser.